Tot World is a secure, welcoming environment. A non-profit organization that offers opportunity for growth and development, respecting the uniqueness of children, supporting diverse families in the community. Teachers are committed to nuturing and guiding each child to their highest potential, thus building successful children and adults. 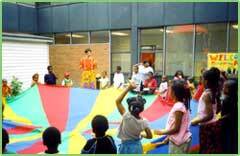 Copyright © 2005 Tot World Child Care Centre.North York, Ontario.